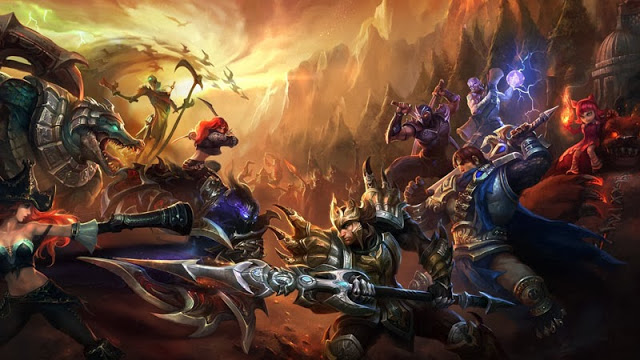 This team composition is comprised of a lot of underplayed champions who are surprisingly making a comeback on the rift. Least surprising is likely Elise jungle, and most surprisingly is likely Nunu support, who hasn't been seen for seasons. The main purpose of this team composition focuses on jungle invades and strong objective control. Although they need to balance farming the lane with invading the jungle, this team can easily make life miserable for any opposing jungler. Check out the full scoop below! Twitch [Marksman] - As one of the few champions remaining with no warning on his invisibility, Twitch can easily position himself for maximum damage behind enemy junglers and annihilate them before they can respond. He also works very well with the attack speed boost from Nunu and the strong front line having a melee mid laner provides. Pantheon [Mid] - The second most unusual pick on this team, mid lane pantheon offers early game pressure. He also has the ability to ult into any part of the enemy jungle from nearby his lane, meaning that with good ward coverage, he can easily turn the tide of any skirmishes that break out during an invade. Nunu [Support] - Nunu support is actually not that bad right now I think, despite his very low win rate. The reason for this is that the new Zeke's Herald actually synergizes extremely well with him, especially considering Glacial Shroud is a core item on Nunu. Additionally, his attack speed boost works very well with Shyvana and Twitch. On teams with only one main auto-attacker his efficiency suffers, but with two he does fairly well. Elise [Jungler] - Every underdog team needs a carry, and this team is no exception. Largely recognized as the top of the meta right now, Elise jungle allows her team to have extremely good early game gank pressure, allowing otherwise weaker laners to snowball. Shyvana [Top Laner] - At the moment, Shyvana still works well as a push and invade type top laner. With good synergy with Pantheon and Elise, their level 2 is easily good enough to win a battle for the enemy red buff. This team should coordinate the invades, and make sure that they push lanes in first. This team should definitely give bot lane a jungle camp level 1, whether it be gromp or golems. Shyvana can also take a camp level 1, as Elise will be focusing on gank and counter-jungle pressure. Beating a team like this generally revolves around having faster spells and staying alive through all the cheese tactics. Twisted Fate [Mid] - With his high range, sustain, and waveclear, Twisted Fate can stay away from eating too many spears. his early game levels 1~3 are also extremely strong in a sustained fight in the jungle. As one of the few champions that can follow Pantheon around the map, he counters him fairly well. Nautilus [Jungle] - Somewhat counter-intuitive since he jungles relatively slowly, Nautilus is actually not bad against counterjunglers. As a super tanky champion with a ton of free stats, he can easily still be effective even after falling behind through a few successful ganks. He also packs enough CC to hold invaders in place if they're trying to do a hit and run. Shen [Top] - An excellent duelist levels 1~3 as well, Shen can make sure to keep Shyvana low enough that she won't be able to successfully invade. His ultimate also works well against Pantheon ganks. Janna [Support] - Any time you have a Shyvana in a game, Janna is always the #1 choice. She also works against Pantheon's W and can easily stop Nunu's ultimate as well. Caitlyn [ADC] - With her auto-counter of Pantheon's ultimate via her trap and ability to bully Twitch in the early game, Caitlyn is an excellent choice vs this team comp and synergizes with Janna extremely well.